DRG 75 501 (Hartmann 3836/1915), photographed at Neuenmarkt on July 30, 1996. Side drawing of class 755 from TB vol.2. 75 515 (Hartmann 3477/1911), photographed in Chemnitz-Hilbersdorf on August 23, 2006 by someone who wishes to be known as Wassen. Source: www.commons.wikimedia.org. DR 75 501 again, this time in normal service, photographed in Löbau in 1973 by P. Klimpel. Photo from my collection. DR 75 521 (ex SäSt 1815, Hartmann 3585/1912), location unknown, 1966. This engine was withdrawn in December 1968. Photo from my collection. SäSt 1870 (Hartmann 3939/1917), location and date unknown – probably a factory photo. This engine later became DRG 75 563; taken over by DR, it was written off in June 1969. Photo from my collection. In 1911, state railways of Saxony Sächsische Staatsbahn (SäSt) introduced class XIV HT passenger tank locomotive, intended mainly for suburban service. Until 1917, 95 examples were built by Sächsische Maschinenfabrik vorm. Richard Hartmann AG of Chemnitz; further eleven followed in 1921, bringing the grand total to 106. 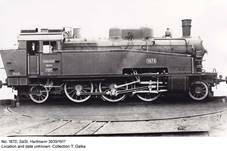 XIV HT was a modern machine with moderate axle load of 16.5 tonnes, running on superheated steam and fitted with Belpaire firebox. Front and rear Adams idle axles were perhaps not an ideal solution for a passenger machine with drivers almost 1600 mm in diameter, but they were considered satisfactory for design maximum speed of only 75 km/h. Prototype (s/n 3472/1911) and next seven examples were initially given service numbers 1343 through 1350, but later they were renumbered and the entire batch was given numbers from 1801 to 1906 inclusive. Several modifications were introduced during production, so that four distinct variants can be distinguished. Later versions (from No. 1816, s/n 3617/1912 onwards) can be easily identified by sloping upper front water box panels. Last 51 examples (from No. 1856, s/n 3925/1917 onwards) had enlarged coal and water boxes; coal capacity increased from 2.5 to 2.8 tonnes and water capacity – from 8 to 9 cu.m. These machines had their conical, pointed smoke-box doors replaced by more typical slightly convex ones. After WWI, four machines went to Belgium and eight to France as a part of war reparations. 83 engines remained in Germany and were impressed into DRG as class 755. 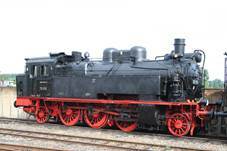 Polish railways received eleven examples, classed OKl101. Together with other tank engines of various types, they were used mainly with suburban trains; their basic characteristics were similar to that of indigenous OKl27, designed for the same duties (in fact, it had initially been planned to base the OKl27 design on the Saxon engine!). All of these comparatively modern and useful machines survived until 1939. According to available data, five (OKl101-2, 3, 6, 7 and 11) were taken over by the Germans and given service numbers 75 506 through 76 510, but it is possible that some of them first fell into Soviet hands and were regained only after Fall Barbarossa. This was certainly the case with further two, OKl101-4 (ex No. 1813, 3583/1912) and OKl101-5 (ex No. 1822, 3623/1912), impressed into DRG as 75 589 and 75 590, respectively. It seems quite possible that all remaining OKl101s fell into Soviet hands, but this is just my conjecture. The highest DRG number, 75 591, was assigned to ex No. 1868 (3937/1917, later ETAT 32-916), captured in France. 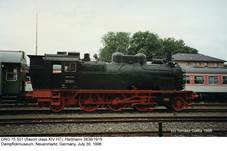 Most engines of this type after WWII remained in Eastern Germany: 89 examples went to DR, last two (75 573 and 75 574) surviving in service until 1970. At least four later went to industry. DB did not use these locomotives. According to available sources, Poland regained just three machines, but the only one on which I have some information is the above-mentioned OKl101-4. Service of these untypical engines was probably quite short and none was preserved. According to EZ, three locomotives served with ČSD as class 355.1. Ex-PKP OKl101-6 (No. 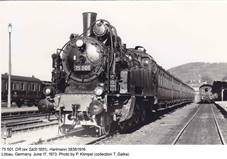 1839, DRG 75 509, 3640/1913) was impressed as 355.1501 and DRG 75 545 (No. 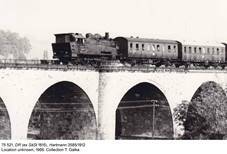 1844, 3829/1915) was probably given no ČSD number; both were withdrawn in 1956. Details on the third engine, apart from its service number 355.1500, are completely lacking. Two examples have survived until today, both in Germany. SäSt No. 1806 (3477/1911), DRG 75 515, the last one in DR service, after withdrawal in 1977 went to Verkehrsmuseum Dresden and later was plinthed in Karl-Marx-Stadt (now Chemnitz), its birthplace. This machine is now preserved at Verein Sächsisches Eisenbahnmuseum (SEM) in Chemnitz-Hilbersdorf. SäSt No. 1851 (3836/1915), DRG 75 501, withdrawn in 1967, was transferred to Deutsche Dampflokmuseum, Neuenmarkt/Oberfranken, in December 1977 and restored to operational status. 1) Refers to later version (from No. 1856 onwards). - Ingo Hütter’s locomotive database (available at www.lokomotive.de).